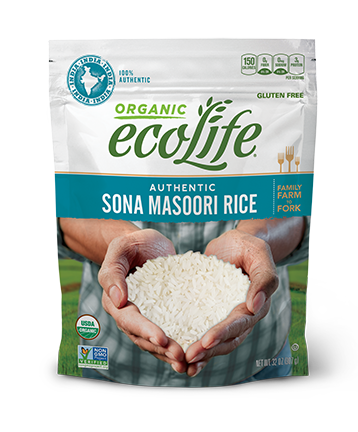 ecoLife® Authentic Sona Masoori is a medium-grain, white rice cultivated on family farms in India’s fertile organic fields. Grown without additives, pesticides or preservatives, it is naturally aromatic and very versatile. In South India, Sona Masoori is the rice of choice for dishes such as sweet pongal, idli, dosa, lemon rice and curd rice. Served plain, it is an excellent complement to dal, sambar, rasam and yogurt. Bring 2 cups water to a boil in medium-size saucepan. Add 1 cup rice, cover and reduce heat to a simmer. Cook for 15-18 minutes or until water is absorbed. Combine 1 cup rice and 2¼ cups water in a microwave-safe tray (1½ qts–2 qts). Cover tightly with microwave-safe lid and cook on HIGH power setting for 18-20 minutes. Remove from microwave. CAUTION. BOWL WILL BE HOT. Fluff with fork and serve. Cover or close lid securely and plug in rice cooker. For 1 cup dry rice, cooking time will be approximately 25 to 30 minutes. Microwaves and Rice cookers vary. Follow manufacturer instructions.